Atypical Myopathy is a disease which has recently established a foothold in Europe and has become something of a growing concern among equine circles. But what exactly is atypical myopathy and – perhaps more importantly – what can be done about it? A myopathy is a disease which damages a horse’s muscles (the word is derived from the Greek words for muscle and suffering). 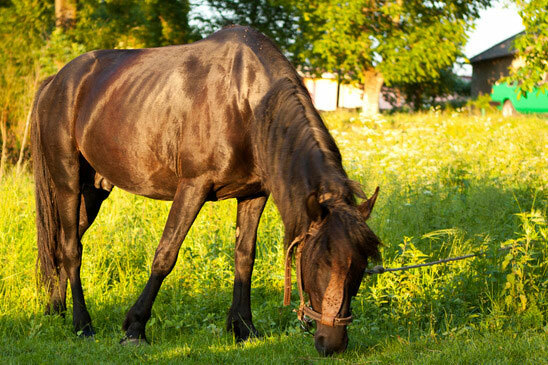 While most of these conditions are linked with excessive exercise, Atypical Myopathy can affect both active horses and relatively sedate ones. Similarly, it can affect horses of all ages – though the very young and the very old are statistically more vulnerable. Though there have been reported cases developing during the springtime, the disease is at its most virulent during autumn – and it is thought that environmental factors associated with the season play a role in the onset of the disease. As a general rule, myopathies of this sort occur most frequently in overgrazed pastures where leaves and other bracken have been allowed to collect on the ground. But since Atypical Myopathy is such a rare condition, researchers have found it difficult to gather enough data to make definite conclusions about exactly what causes the disease. In 2013, researchers from the University of Liege studied seventeen affected horses from Belgium, Germany and The Netherlands. The researchers commenced their work with a fair idea of where to start. In the United States, sycamore trees have long been linked with Seasonal Pasture Myopathy, a condition related to Atypical Myopathy. Sure enough, the research found a strong correlation between the development and the condition and the presence of sycamore trees. Seasonal Pasture Myopathy is linked to the box elder tree (Acer negundo), whose seeds contain a toxin known as hypoglycin-A. In the Europe, a related species of sycamore (Acer pseudoplatanus) contains the same toxin. This would seem to suggest that the toxin in question contributes to the development of Myopathy. Muscular degradation of the sort caused by Atypical Myopathy will most obviously affect a horse’s mobility. The horse may be unwilling to move and will have difficulty standing up; they may also shiver and sweat. Less obvious will be the effects on the horse’s internal organs – specifically the heart, lungs and diaphragm. The horse’s heartrate will increase and they may have trouble breathing properly. Should you notice that your horse has developed these symptoms, you should contact your vet immediately for treatment in order to give your horse the best possible chance of survival. Sadly the overwhelming majority of cases will prove fatal. For this reason, horse owners should act as swiftly as possible if they suspect that their horse has contracted the disease, as the earlier corrective action is taken, the greater the likelihood that the horse will recover. Since the disease is so poorly-understood, treatment will largely consist of managing their symptoms. Affected horses can be treated with intravenous fluids and intensive care. If the animal’s prospects look sufficiently bleak, the vet may recommend euthanasia. As we have seen, once it has developed, Atypical Myopathy is extremely difficult to treat and often fatal. It is therefore imperative that preventative measures be taken. In the main, these measures consist of keeping careful watch over a horse’s diet. A hungry horse might be tempted to eat things which perhaps they shouldn’t. Fallen leaves, bits of dead wood and the notorious sycamore seed might, in the absence of better options, seem like acceptable foodstuffs. A well-fed horse, by contrast, will be more discriminating and picky. Ensuring that their field is not overgrazed is therefore essential in guarding against myopathy. Where this is impossible, the horse’s diet should be supplemented appropriately. While a well fed horse might not actively seek out alternative forms of nourishment, they may still stumble upon them by accident and eat them out of idle curiosity. Owners should therefore ensure that such temptations are, where possible, removed from the field. You should carry out periodic inspections of the paddock in order to ensure that it is kept clear – particularly during autumn, when leaves and other bracken are more likely to find their way there. For similar reasons, the spread of weeds in the paddock should also be strictly controlled. Removing leaves and weeds is a relatively straightforward task. Removing trees is considerably less so. Some may be tempted to uproot and destroy any tree which might pose a threat to the horse. While this may be fairly sensible in the case of smaller saplings, it can be a significant undertaking the case of larger sycamore – and an unnecessary one. It is often sufficient simply to ensure the horse cannot get anywhere near the tree and what may fall from them. You might consider installing a fence around any problematic trees, in order to prevent horses from straying nearby. Unfortunately, the sycamore has an attribute which may thwart this endeavour; its seeds have adapted tiny, distinctive wings, which allow them to float over large distances. This is good news for the sycamore tree and its progeny, as it allows them to spread across the land. It is bad news, however, for horses which might decide to eat them. Much of the factors linked with Atypical Myopathy occur outdoors, so you may also wish to limit the time your horses spend out in paddocks and return them to the stable during the night. This strategy may well be worthwhile in the autumn, when the threat is more acute. Atypical myopathy has, in recent years, acquired considerable notoriety. This is understandable when one considers the devastating impact it can have on an otherwise healthy horse. It is worth concluding by putting this concern into perspective. While the disease is certainly on the increase in Europe, it is still a very rare case. Having taken the precautionary measures described in this article, horse-owners can be assured that the risk to their horse has been drastically minimised.